Oh I'm definitely renewing my tickets, just thought it was a fun way to promote UND football. Even if they aren't doing a raffle they could still be promoting to renew your tickets. You are definitely right on having more reasons to renew this year. Remember, 6 home games is only the minimum, would you be happy with the minimum? 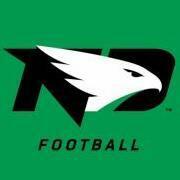 https://kfgo.com/podcasts/fighting-hawks-podcast/962/development-of-the-offensive-line-key-for-und-in-spring-practices/ Interview with Freund on KFGO. Nice to have a little Saturday morning football talk. A little disappointing if Boltmann won't ever crack the QB depth chart, but if he can be a contributor at WR makes sense to move him. With a full recruiting year to work with, I'm confident Freund will get another good QB recruit in the next class. Hopefully we go after a JuCo or transfer QB as well for the 2020 season for depth purposes and to push Grover/Schuster. Imagine a 6 vs 3 matchup with NDSU (assuming still possible). Wouldn't that be fun to get pay back in Sioux Falls. what's Wesley Jeffries up to? Not sure I see him playing much on the OL, maybe he wants to switch back to NG for his last season. Just an honest question...does the NCAA or even schools prepare lists of approved workout supplements? Anyone got any idea who is being looked at for DL coach? Or who would be a good (and realistic) hire? I went back and found the part in the 360 Podcast in early January where they mentioned 6 QB's they thought we might have interest in. Two are now "gone" (Graetz, Riley Kinney) The four that remain: Walker Kinney 6'3" 215# Stilwell, KS - Pretty good runner, has or had offers from WIU and SDSU Jayden Johannsen 6'2" 200# Sioux Falls, SD - Believe NDSU offered PWO Hayden Ekern 6'2" 200# St. Rita HS (Chicago), IL - originally committed to Montana St. this summer, but they rescinded his offer after coaching changes Matt Campbell 6'5" 215# Fort Scott, KS - Good size, has some touch, but probably more of a project, played some TE Freund follows the last 3 on twitter, doesn't follow Kinney. I'm going to wait until the kid actually commits somewhere before reacting. His likes would most likely mean it's not a good chance, but who knows what the kid is actually thinking. If he signs elsewhere so be it. I'm sure Danny has Plans B,C, and D at this point. Maybe with Danny overseeing QB recruiting we land a big time 2020 QB recruit and the 2019 recruit is a moot point. All we can do is hope for the best. Also would still love Nelson or Pierre to commit, they'd be very nice additions. Just offered Graetz per his Twitter. Must at least have a chance if he tweeted it?? From the FB360 site "The first official recruiting weekend of the 2019 “second season” will be on January 26th." hopefully we can get some of the final pieces of this class committed. I'd expect at least one QB to be on campus. Should give us a better idea of who we are still actively targeting anyway. Who can blame the kid, Texas State did wonders the last time it landed a big time QB recruit. Anybody else remember how good Paul Blake was?